I’ve been super excited about this topic, because I’ve been trying to read more diversely this year. Some of these books I like so much because they really focus on the whatever makes the characters diverse (race, mental illness, sexual orientation, etc) and others are on here because they present diversity without ignoring it or making it the center of the story. Please share your favorite diverse books with me in the comments. I’m always looking for more! Thanks to The Broke and the Bookish for hosting this weekly book meme. 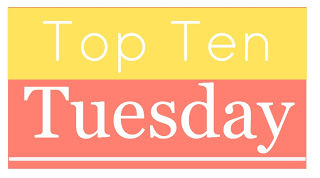 This entry was posted in top ten tuesday and tagged books, diverse books, Top 10 Tuesday, Top Ten Tuesday by Alison Doherty. Bookmark the permalink. Fantastic list! I loved so many of these. Happy reading. It’s funny; I actually read a few of these books without recognizing them as “diverse.” Now it seems clear that would’ve been part of the draw, same as it was when I moved to Los Angeles: I wanted to be where I could find some of everything. I’ll seek out others among these, because it’s been way too long–months!–since I dived into fiction. I really liked Eleanore and Park. You’ve got a great list! Oh man! How did I forget about Wonder?! I love that book so much! You have listed a lot of really great books! One day I will get to OCD A Love Story. Jennifer @ A Librarian’s Library–My TTT! I love your list. I considered WONDER but left it off because I was focusing on YA books and I really think of it as a Junior book…but I think it is WONDERful! Such a great list! I’ve been wanting to read None of the Above and Aristotle and Dante Discover the Secrets of the Universe people only have great thing to say about the two of them! And I am so keen to read Wonder!! Ah!! Great list! I’ve been wanted to read brown girl dreaming but I’ve read most of the others! Happy reading! Wonder! I can’t believe I forgot that one! I could’ve sworn it was on my list. These are some great picks. I’ve heard Brown Girl Dreaming is really great! I’m glad to see None of the Above made your list because I’m really looking forward to that one.